Vasudhaiva Kutumbakam- The world is a family! Think positive thoughts, laugh, love & live happily! Removes barriers like caste, creed, religion & nation. Silence issues/problems regarding terrorism or border! Let's use our resources for world's bright & #OpenFuture. I answered- "The one thing I would change to build a more open world — and how would I go about it"
What do you think? How would you build a more open world? Do share in the comments below. We seem to have a long way to go in having a more open world. The silent of the world tend not to speak up until it is intolerable and by then we are again in conflict. I like your premise and hope at least some of it can happen. Thanks for participating with us. I would also say that through the silence of blogging we speak. We open ourselves to one another and learn from each other. This is a great step in becoming more in step with one another. I like your poem, Anita. That's how I feel, too, about having a peaceful world. I was very surprised when the guy in the White House was elected. I thought our country was further along in being tolerant and accepting others differences. I love this poem, and the vision of a more accepting world. I do think more of us hold this vision than the darker one......we should be able to accomplish this. A better world starts with each of us inside. I also believe in positive thoughts and we start spreading the good news, when we have a positive attitude towards life. That's major contradiction. I'm releasing through laughter, but I could as easily cry. Do you think we could actually cleanse ourselves of negativity and evil? I will try to believe, and I will continue praying. All the positive thoughts hide the present ugliness of the world. Cleverly done Anita. We must keep holding these ideals! Good advice about thinking positive thoughts. I love the idea of celebrating differences. Hope-filled poem! Never loose hope... but people are the one who make bad lives for lots of their species, so sad! Uniting in silence and striving to be the best as human beings. Inspiring thought. 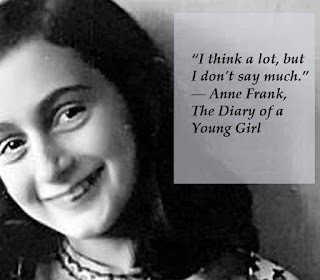 Love the thought by Anne Frank.